The Jeff Awards Committee (Chicago’s version of Broadway’s Tony Awards) has made changes for the next awards cycle, and will now only give out one award for each Non-Equity Jeff Award category (save for “New Work” and “New Adaptation”). As of August 1st, Chicago Dramatists is officially 30-years old! Happy Anniversary! That’s 30 years of helping playwrights, holding staged readings, and developing plays to shape and contribute to the world of American repertory. Check out their website (www.chicagodramatists.org) to see what’s happening during the upcoming momentous year. 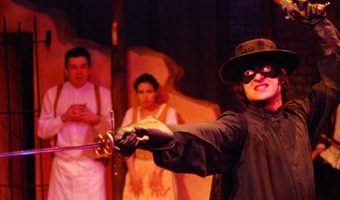 Due to high ticket demands, the critically-acclaimed Mark of Zorro, which just closed at Lifeline Theatre on July 20th, will be remounted at the Theatre Building on Belmont Avenue (see our review here). Zorro will re-open on September 27th. Picture courtesy of Lifeline Theatre’s website. Entries from PerformInk Online. Looks like there were a few big winners at the Non-Equity Jeff Awards given out last night, including 5 total awards given to Lifeline Theatre for The Island of Dr. Moreau. Another 4 awards were given to Theo Ubique for their intimate production of Cabaret. Special Non-Equity Jeff Awards were given out to Raven Theatre’s founders – Michael Menendian and JoAnn Montemurro.